What is Stand Up Paddle Boarding (SUP)? What are the different types of Stand Up Paddle Boards? Do I buy a Solid or Inflatable SUP? What paddle do I need? What brand SUP do I want? I have my SUP board & paddle, what other accessories do I need? How do I look after my new SUP equipment? SUP is an acronym that stands for “stand up paddle boarding” and it is one of the fastest growing water sports. A combination of kayaking and surfing, this sports is fundamentally standing on a surfboard and using a paddle to propel yourself. Stand Up Paddle boards are longer, wider, and more buoyant than traditional surfboards, which enables you to comfortably balance on them. There are three basic types of stand up paddle boards: surf, allround, and flatwater/race. Surf specific stand-up paddle boards are typically shorter, have a narrower nose and tail and more rocker (curve) than allround, and flatwater/race boards. Surf paddle boards are perfect if you are always going to spend your time in the surf. The narrow shape makes the board much more maneuverable on a wave, but the trade off is that is that they are slower and don’t track in a straight line on flatwater and are also often less stable. 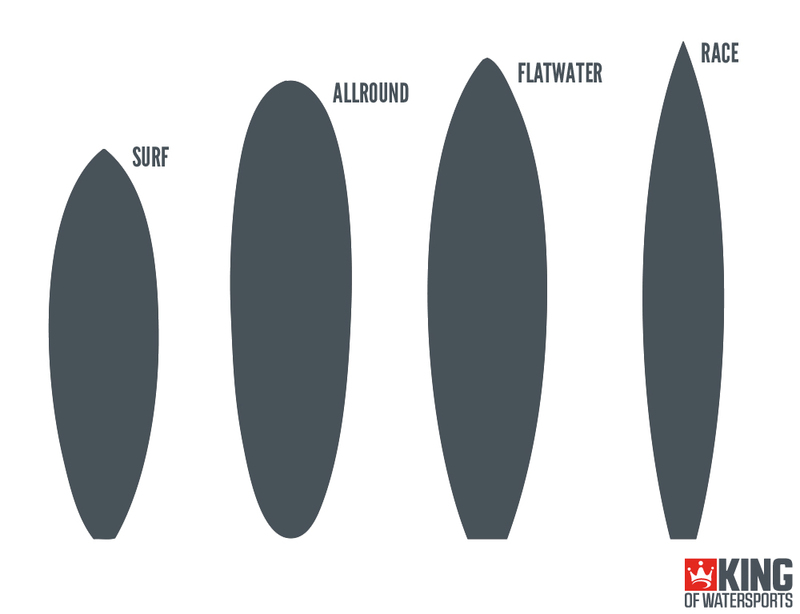 Allround boards are typically thicker, wider, and longer than surf specific models. These versatile, multi-purpose boards are great first time boards because they allow you to explore all aspects of the sport with only one board. Allround boards are wide enough to be very stable, have decent glide and tracking for flatwater paddling or open ocean touring, but also enough rocker and sidecut for decent surf performance. A windsurf option is available on some allround boards. A mast foot fitting is included on the deck of the board so that a windsurf sailing rig can be mounted, making these boards exceptionally versatile. Solid stand up paddle boards are built of many different materials from foam, fibreglass, kevlar, plastics, and wood. 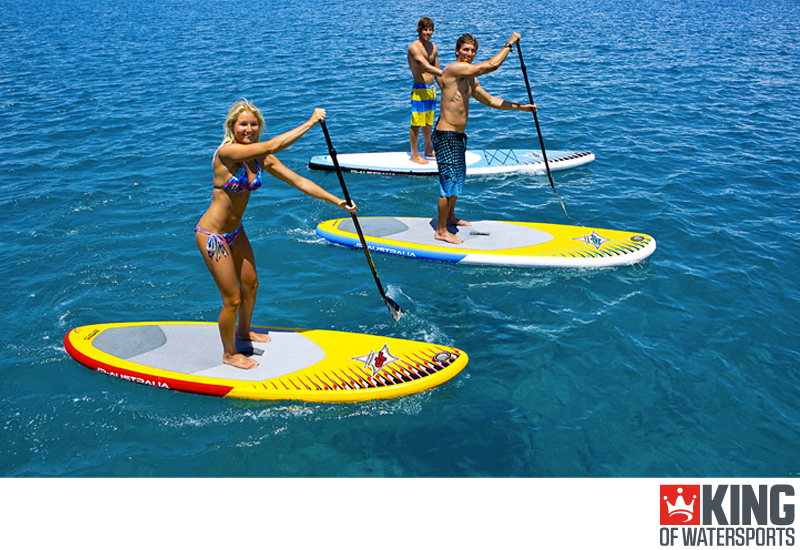 At King of Watersports, we only offer the high-end performance solid stand up paddle boards made from epoxy fibreglass. Epoxy boards are made from a foam core laminated with layers of fibreglass for strength and rigidity. Most solid stand up paddle boards have an air vent installed on the deck. Air vents are used as a way to help prevent delamination of the epoxy resin from the EPS foam blank. No inflation time required. You can get straight out on the water. Super stable with stronger wind or choppy water. Ultimate performance regarding speed and agility or for tricks while surfing. Inflatable stand up paddle boards (iSUPs) are manufactured from layers of PVC plastic with woven fibres connecting to the top and bottom inside the board and are surprisingly rigid once inflated. Inflatable SUPs tend to be a little lighter than many Solid boards because they are composed mostly of air. Minimal storage space required as iSUPs pack-down into a backpack. Easily fit into an airlines hold allowance for travelling abroad. Perfect if you want to paddle in locations that are not easily reachable by car. More affordable than solid SUPs. Learn more about Inflatable SUP technology. 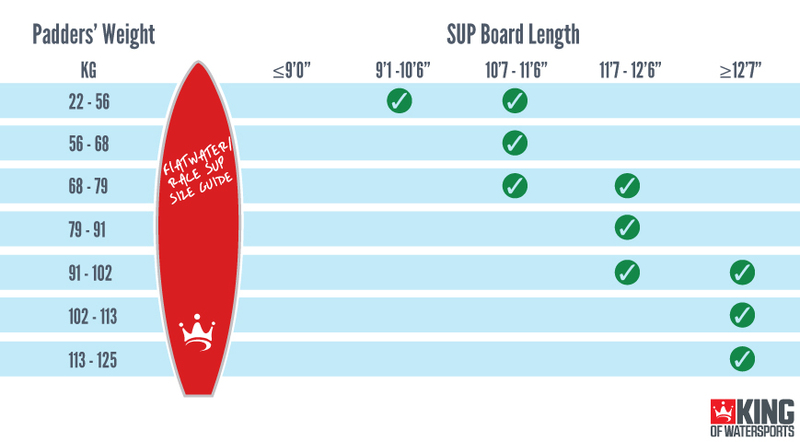 Board volume and length are key factors when selecting the right size stand up paddle board. Use the formula below to estimate of how much Volume you should be looking at in your board. 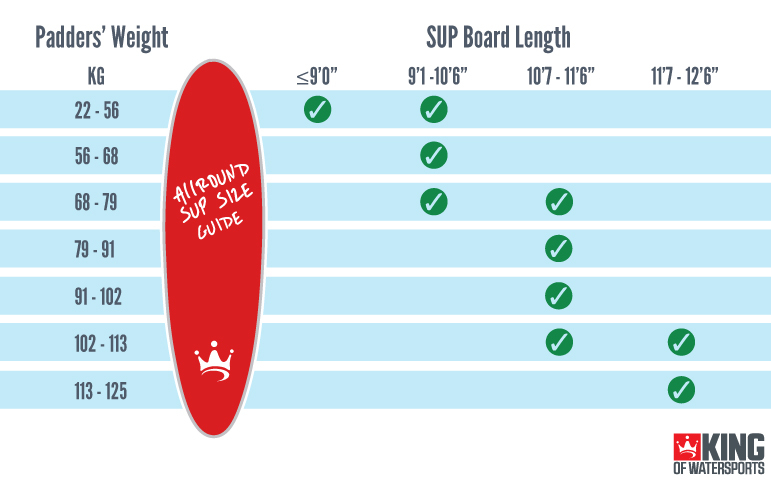 Please use our SUP board length size guides below to find the best suited stand up paddle board to you. SUP paddle handles either have an ergonomically design to fit the palm of your hand or a more straight 'T bar' feel. The ergonomic handle design is more popular, but some people do prefer the traditional'T bar' grip. The shaft is considered the most important part of the paddle, it can be made of Aluminium, Glass fibre, Carbon, and sometimes Kevlar. The material of a paddle makes a big difference to the performance. Carbon - Most common material, which provides the paddle with stiffness and memory. Glass fibre - Budget material, which can bend more making a paddle softer in the stroke. Aluminium - Rigid material, which can be heavy. Kevlar - High impact resistance, which performs very similar to Carbon. Stand up paddle blade sizes can vary from large to small. A large blade will displace more water in the paddle stroke and offer more power on demand. However, in the hands of a beginner paddler, the larger blade size may disable them with shoulder pain over time. As a rule of thumb, smaller blades are generally preferred in the surf and are gentler for all users, ladies especially. Larger blades are used more in distance or downwind paddling. 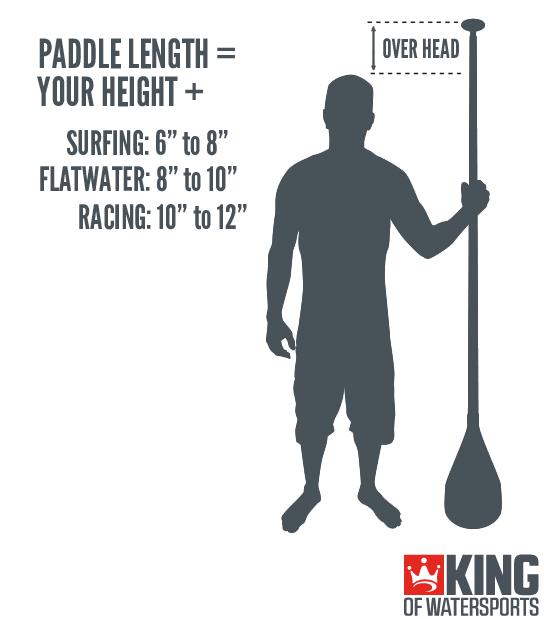 To maximise your performance and enjoyment on the water, you need to have the correct stand up paddle length/height for the type of paddling you decide to do. Surf SUP paddles are usually between 6-8 inches above the paddlers height due to lower stance taken in surfing. Flatwater SUP paddles are usually between 8-10 inches above the paddlers height for improved reach and power in each paddle stroke. Racing SUP paddles are usually between 10-12 inches above the paddlers height for maximum reach and power in each paddle stroke for speed. If you want to stand up paddle board in both the surf and on the flatwater, you can either buy two paddles or buy an adjustable. The size and shape of a blade has a big impact on the performance of a paddle for SUPing. The graphic below explains this visually. 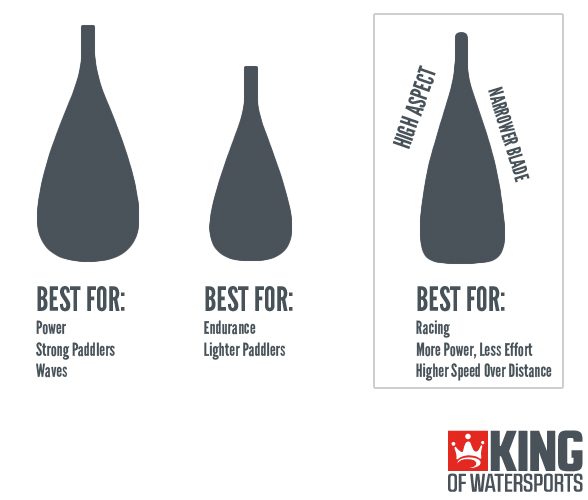 At King of Watersports, we only stock the highest quality stand up paddle board brands in the industry. Which ever brand you choose with us, we guaranteed you will be very happy and hitting the water. You can choose a brand that you know or try out a new one. 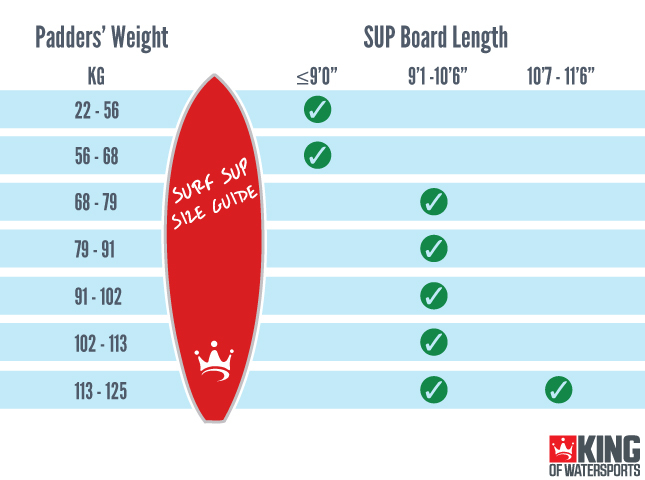 We are confident that all of our SUP brands have great like for like features of the highest standard. While not always required, a leash is a good idea as it is what keeps you attached to the board if you fall off. Stand up paddle board leashes are especially useful in choppy conditions or when catching waves. Coil: This leash is designed to stretched out when under tension (ensures your board is at safe distance when you fall off) and to coil up compactly when paddling. This helps prevent the leash from dragging in the water. Standard: This is a regular cord leash similar to surf board leashes. These are less likely to tangle if you are moving around on the board. They will drag in the water but are usually lighter than a coil leash. A general rule of thumb is to have a leash as long as your board. For stand up paddle that can get pretty long. Depending on your skill level and paddle style this can vary. A leash that is within a couple feet of the length of your board will usually do the trick. Longer: Allows the board to float further away reducing risk of the board hitting you. Good in choppy or surf conditions. Shorter: Keeps the board closer to you if you fall off. Often preferred in flat water as there is a much lower risk of a wave pushing the board into you. A buoyancy aid is important even for the experienced paddler. Conditions can change quickly and you always want to be prepared. In some areas they are also legally required and you can be fined if you do not have one. Check your local laws to find out more. Buoyancy aids should always be coast guard approved to be sure they meet safety standards. A good wetsuit can allow you to extend the paddle season well past the warm days of summer and even into the cold winter. You can add booties, gloves and a hood to still get out even in the winter conditions. The warmth of a wetsuit is determined by its thickness which is measure in millimetres. You will want to know the water and air temperature you will be in to help determine what is right for you. Please see our wetsuit guide for more information. Once you have bought your new stand up paddle board equipment, the guidelines below will help you maintain and extened the life of your gear. Store your SUP equipment out of the sun, in a dry and shaded area. Transport your SUP board and paddle in a protective bag to prevent damage. Be careful putting the board in the water and taking it out. There may be rocks or other sharp objects when putting your board down. Be careful when you are paddling and avoid any obstructions that can damage your board, paddle, or fin. If you have a vent plug, close it when you go out on the water. This will stop water getting into your solid SUP board and damaging the foam core. If you have a vent plug, open it when you are storing your solid SUP board. This will stop pressure building up inside and prevent your board from blowing up. Wash your SUP equipment after going in saltwater, be sure to get the fin boxes, slider nut and screw, as well as the deck pad. Regularly check for dings and cracks on your board and paddle. Be especially aware of your board's nose and rails. Those are the two most common areas that get damaged. If you find anything that has the potential to let water into your SUP board, get it taken care of immediately. We offer products like ding tape that provide a temporary patch if it is not serious damage or if you are not able to repair it right away.